After extensive discussions and despite reasonable fears of failure, in June 2004 EU leaders finally adopted the Constitutional Treaty, which will replace the Nice Treaty. After signing the Constitutional Treaty in autumn 2004, Member States will have two years to ratify it. This article presents an environmental analysis of the draft Treaty as submitted by the Convention on the Future of Europe in July 2003. Issues, which at first sight may not appear closely related to the environment, can, in fact, be expected to have crucial implications for EU environmental policy in the long term. The authors identify potential environmental implications and key opportunities for future improvement and point out some of the most important institutional provisions of the draft European Constitution which are likely to have environmental repercussions. The article is based on the project "EcoFuturum - Europe's Democratic Challenge. Actively Shaping European Environmental Policy", which was co-funded by the European Commission. An abstract of the article and the bibliographic references are available at Kluwer Law International. 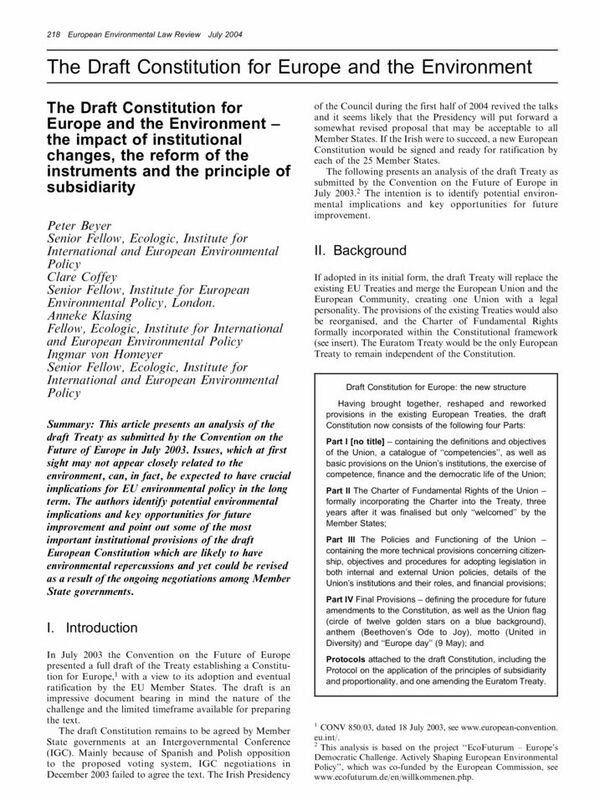 Beyer, Peter; Clare Coffey; Anneke Klasing and Ingmar von Homeyer 2004: “The Draft Constitution for Europe and the Environment – The Impact of Institutional Changes, the Reform of the Instruments and the Principle of Subsidiarity”. European Environmental Law Review, Vol. 13, No. 7, 218-224.